Daniel has been devouring these books all summer. Tera not as much partly because she has already read them on her own before. We've been watching the old BBC set of Chronicles and Narnia we recently found cheaply at a thrift store. They have also been watching the new Disney The Lion, Witch and The Wardrobe as well as Prince Caspian. Then they pooled their money and earned the remainder to buy the audio dramas by Focus on the Family. They listen to these as they are falling asleep at night. We've always let them listen to a "tape" at night to wind down. This summer this is all they have been picking. 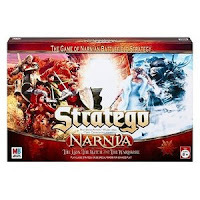 Finally, two friends suggested the game Stratego to us this summer. When we found out there was a Chronicles of Narnia version, it was our obvious choice. The first day they played this game 4 or 5 times. Now they are begging for someone to play with them. 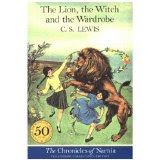 With all the things kids get wrapped up into these days, Chronicles of Narnia sounds pretty good to me.